Introduction: The Boy's Own Paper published five articles in England in 1895 describing the construction of a horizontal gas engine. That is town gas, not gasoline (though read on...). It is said that this design provided the inspiration for the first Petter gas engine. I discovered the articles during the seventies, and have finally found time to study them. I hope, if possible, to build an engine. A full set of castings is available from Jackson & Co. of High Street, Brentford, price £2 10s, (which was then about 2 weeks money for a working man) and a full size drawing for a further 5s. Progress so far: I have disentangled the labyrinthine Victorian prose, but the woodcut illustrations, though they are many, have defeated me. They are distinctly not to scale and yield conflicting results when stepping off with dividers from known dimensions.For example, the flywheel appears to be somewhere between 10" and 14" in diameter when scaled up from the views I have. Jackson & Co. seem to have moved without leaving a forwarding address, so at present I am faced with making a 'recreation in the style of' rather than an authentic reproduction. My Quest: is to track down a surviving example, a set of castings, or (a chance in a million) the full size drawing so I can get some accurate dimensions. My guess is that a number of castings were bought and started, very few were finished, and there may be one copy of the drawing surviving in a pile of papers somewhere. I'd gladly give 7/6d for a copy! Identifying the engine wouldn't be easy because as far as I can tell there were no identifying marks on the castings. My Request: I have corresponded with various gas engine enthusiasts who have heard of it but never seen one. So, any information, suggestions of places I might look, more people I might ask, piles of paper I might search through... anything will be welcome. I realise that the likelihood of one ending up in other countries approaches zero, but I am hoping that the British readership will come up trumps. It looks to be a similar size to the gas engine featured in year one of "Model Engineer", the ME motor, rated at about 1/4hp has a bore of 2", and a stroke of 3"(3 1/2"? ), it has an over hung crank. Ah..... By Atlas, if memory serves. Quite different in many respects. A good friend of mine picked one up at a local flea market missing very few ancillaries. Odd thing was that all four mounting feet had been broken off and replaced with rather nasty looking Iron " L " brackets. The ME engine you are referring to was available as a kit from at least three different houses in the London area. One had a non spoked flywheel with just oval shaped holes to reduce weight. Hmmm....... On second thoughts...... Might be a very early Leek, I had one, an atmospheric water cooled version. They changed the horizontal mount to vertical in the late 1890's. Ian, this is probably the one you arte thinking of that was serialised in "Model Engineer and amature Electricial" 1898 that I posted over on ME. Thanks for the useful information and comments. The picture is particularly helpful as it helps me visualise what the base of the 'BOMGE' (I'm already fed up with typing it out in full!) would have been like. There are enough differences in the cylinder casting for me to believe it isn't a BOMGE, and the ignition and valve gear are quite different, though I could believe those to be modern alterations. Is that an aluminium cylinder head? I've attached a couple more views from the BOP articles in case they help to clarify things. I have extracted the second side view from the original title block, which is why it is partially draped in cloth. By the way, the engine was noted as running up to 250 rpm, about half the speed of the one in Jason's advert. One question I will have to solve is compression ratio, as I don't have enough dimensions to work out what it was. I know the early Model T Ford ran at about 4:1 compression ratio. Would that be realistic for this one? Hi George and welcome to MEM. It looks like you are getting some of the help you need for this project. When you have a chance, please post an introduction in the "Introduce Yourself" section so that everyone can get to know you and extend a welcome. George, I have some dimensions for that one I posted above from which you will be able to get a compression ratio, will scan it a bit later. 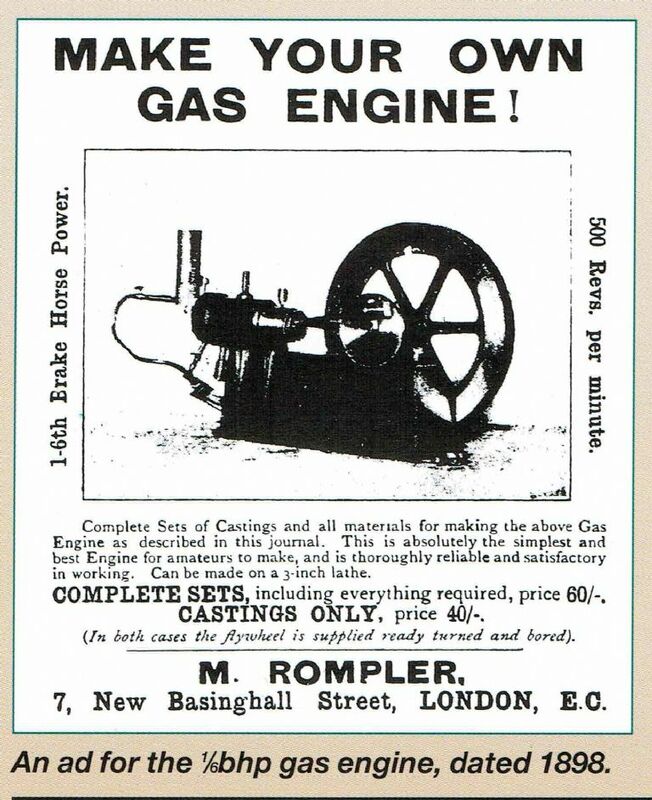 I also need to look through some copies of Stationary Engine mag as I'm sure there is another similar engine but can't remember what type of ignition it is. The picture I posted, in retrospect, is probably a Leek. Regarding the valve gear, I have seen chain drive fitted at least once. Percy Gallimore had a 1/2 HP Leek that had spent its working life at a bicycle repair shop. The builder had fitted not one but two 2:1 reduction chains to operate the individual valves. When HT ignition became more common many small power gas engines were converted as the timing could be set very precisely. From my own experience in both building and restoring small power gas engines a compression ratio of up to 4:1 will work nicely. Hot tube ignition gets very unstable the higher the compression pressure gets. Many manufacturers fitted a mechanical valve to open the tube at the correct time on larger higher compression gas engines. In your email to me you mentioned the problem of what size the flywheel might be. I would suggest 9" to 10" diameter. From that figure you can easily dimension the size of the rest of the parts for pattern making, don't forget to add the shrinkage value of 1/8" per foot linear for Cast Iron. I've done this a few times..... Please don't hesitate to ask for advice. From those last couple of images it does look an easy one to fabricate as I mentioned on ME. The main frame could be done with 6 main parts - the thicker curved bearing pedestalls, the remaining sides and the two ends. Cylinder is just a turning job with a few bosses and mounting brackets silver soldered on ( see my Lightweight build) and rather than have to make cores to get a water jacket just press in a CI liner. There are enough flywheel castings about to find one that suits. As Graham says 9-10" flywheel would be about right as a lot of models are based on what can fit a myford gap. Though like the ME one could it have come with a machined flywheel as that is 13 3/4 dai ? PS also sent you a message. Thanks again for all the useful ideas and information, and the welcome. It is reassuring that a 9-10 inch flywheel would suit, as that fits with the BOP's statement that all machining could be done on a 3 1/2 inch gap bed lathe. 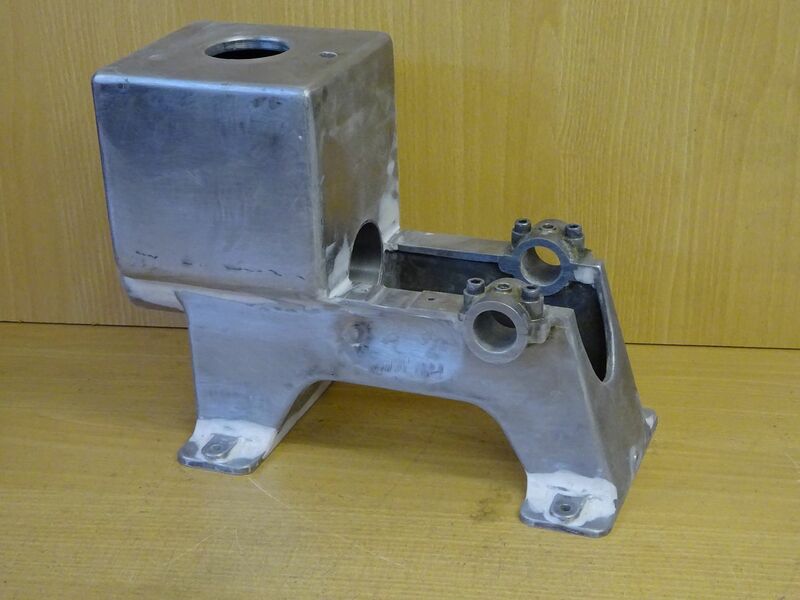 The castings weren't available ready machined. Jason, your suggestion of fabricating the main parts goes right to the heart of a decision I am wrestling with. Quite simply, shall I make the machine as authentic as possible, or shall I make a modern interpretation of it? On the one hand I could make patterns, commission castings, cut gears, make or obtain authentic oilers, nuts, gas taps, valves and so on (though I draw the line at turning on a treadle lathe or fitting castings by filing). That would make a historically representative engine. On the other hand I could fabricate the base and cylinder, use Myford change wheels to drive the exhaust valve and so on. Heavens, I could even use millimetres on the drawings! I would end up with a nice engine, but it wouldn't be the Boy's Own. However, I could then tinker to my heart's content with valves, ignition, compression ratio and all those things. Perhaps I should make both. Henry Greenly's book 'Model Engineering' has plans for a small hot tube ignition 1/8 HP gas engine. This is 1 11/16" bore 3" stroke with a 7 3/4" flywheel and overhung crankshaft. As the book is currently in (re)print I don't know if I can post the drawing on here? If you would like I could scan it and send as a PM/email. Ultimately the choice is yours. I know which route I would take !! There's a great book, still available called The backyard foundry by B Terry Aspin. It contains valuable information in all areas of foundry work with a great section on patternmaking. I was lucky to be mentored by him on occasions as he was a member of the Wrexham ME society. His small cupola is still in use today. I have attached pictures of 3 engines we built, just from either a drawing or plan, might spur you on? The last image was to be the largest engine we ever built but the foundry closure scuppered that one ! I think I would go for a half way house for your construction options. Fabricate the frame and cylinder and buy in a flywheel. The rest I would make as near as possible to match the original. I suppose that boys with enough pocket money mqay well have poped into Bond's and bought ready cut gears, oilers would also have been readily available. I quite enjoy the fabrication option so would go that way but I know others who prefer castings. This is one I'm fabrication at the moment. I have had a look through my A-Z of British Stationary Engines but there is no Entry for Jacksons, they may just have been a foundry rather than a maker. There are several other "small Power" engines with similar features, quite a few from the London Area as Graham mentioned above but all teh illustrations are too small to glean much detail. Several of these engines were available ready to run or as casting sets or part machined. Bad Behavior has blocked 16038 access attempts in the last 7 days.